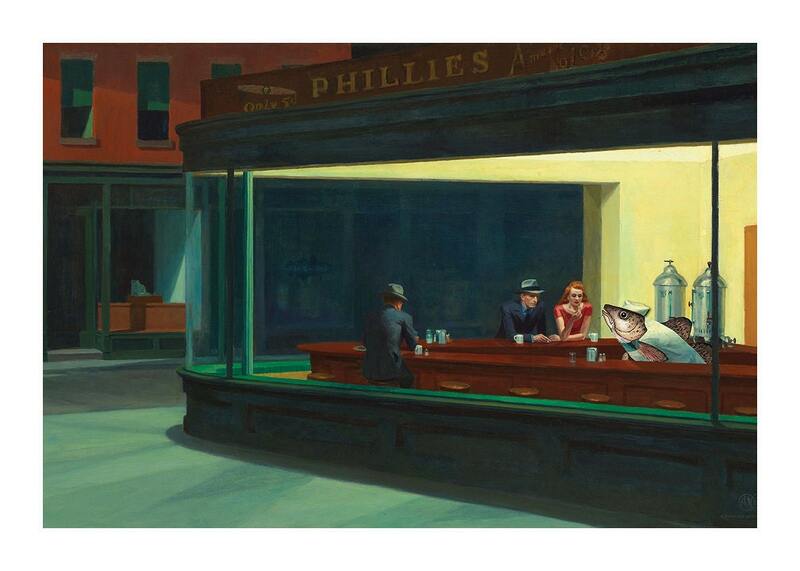 “Nightshift” is based Edward Hopper’s famous “Nighthawks.” The counterman has been replaced with a countercod. This is part of a series I call “Hopper Cods” that are all derived from paintings by Edward Hopper. In 1930, the Hoppers rented a cottage on Cape Cod in South Truro, Massachusetts. They returned to South Truro every summer for the rest of their lives, building their summer house there in 1934. This image is printed on heavy uncoated stock with pigment inks and is suitable for framing. The card measures 7 x 5 inches and there is a 3/8” white border around the image. The inside of the cod is blank for writing. As with all Cape Card cods, an envelope is included, and the card is packaged in a clear cello sleeve. Copyright © 2017 by Andrew Newman for Cape Card®. All rights reserved. It is beautiful, evoking nostalgia along with its whimsy—love it. It is definitely suitable for framing.